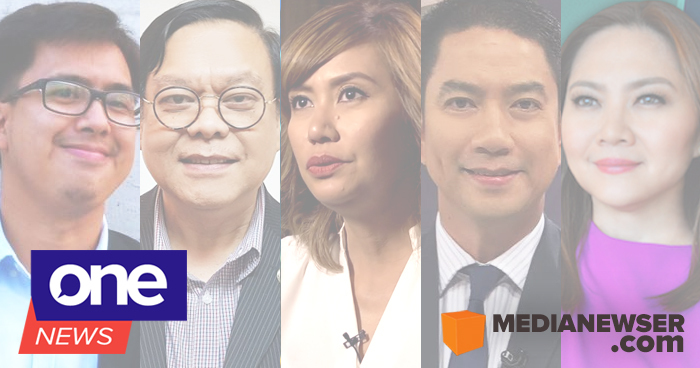 In the promotional video that ran during Friday's BusinessWorld Economic Forum, One News introduced its on-air team composed of a diverse group of individuals across all of Manny Pangilinan's media properties. They are Ed Lingao, Roby Alampay, Jove Francisco, Cito Beltran, Tony Abad, Mike Toledo, Amy Pamintuan, Marichu Villanueva, Danie Laurel, RJ Ledesma, Charles Lejano, Carlo Ople, Shawn Yao, and JP Ong. Also included in the lineup is legendary newswoman Cheche Lazaro, who is returning to TV after a four-year long hiatus. With its launch just a week away from today, we thought we should come up with another list of broadcasters who we believe can help One News in its "pursuit of bringing multimedia journalism to more exciting, interesting and insightful level." Feel free, of course, to add your own selections below in our comment box and join the conversation on our Facebook page. You can also tweet us @medianewserphil. One contender who is already part of the MVP family is Atty. Mel Sta Maria, the longtime co-anchor of Radyo5's Relasyon. Sta Maria, who is also the dean of FEU Institute of Law, has been one of the most influential and most trusted political pundits in this age of Duterte — the voice of reason in these dark and troubled times. His commentaries and editorials for Manila Bulletin, and before that, InterAksyon, have attracted scholarly attention, to the point that some social media influencers and advocacy groups are floating the idea of him running for the Senate in 2019. Like how effective he was with his analysis during his time as the resident legal analyst of TV5, Sta. Maria could once again assume that role at One News. To put up a news channel is one thing, to make it successful is another. If One News really wants to succeed and avoid suffering the same fate as AksyonTV and Bloomberg TV Philippines, then Manny Pangilinan and his team should begin thinking outside and beyond the box. At this point, they should look beyond their usual prospects — like some of the TV5 imports they have right now — and hire people who can help take this new media venture to another level. Eliza Zamora-Solis, the award-winning alum of The Probe Team, fits that bill perfectly. In her nearly two-decade career in the industry, the veteran journalist has produced a cohesive body of work, having been the brains behind some of GMA Public Affairs' top-rating and critically acclaimed programs such as Bayan Ko, I-Witness, and Case Unclosed. For similar reasons, One News should also consider recruiting Jayson Bernard Santos, the man behind some of GMA Public Affairs' award-winning documentaries. Like Zamora-Solis, Santos, who left the Kapuso Network earlier this year, would also be a perfect choice to head up one of the channel's production units — and in his case, documentary programs that One News would probably like to include in its programming lineup. In our interview with him in January, Santos said he is keeping his doors open for another TV job, saying: "There is still a possibility that I might reintegrate soon or re-enter TV job. But should I return to the exact same role or career path, I will make sure that I show up to do my job entirely differently from the past. I will learn what my strengths are and what would make me more fulfilled and aligned at work." Some of his notable pieces include the 2013 I-Witness documentary Burn, which took home a Silver World Medal at the 2013 New York Festivals; Reel Time's Isang Paa sa Hukay, which won a World TV Awards 2016 and a Bronze Medal at the 2016 New York Festivals; and Maling Akala, which received a Gold World Medal at the 2017 New York Festivals and a Silver Screen Award from the U.S. International Film and Video Festival. If there is an underutilized member of the GMA News anchor team, it's Ivan Mayrina, whose only regular program at the Kapuso Network is the long-running Unang Hirit. The young news veteran, who was recently awarded with the Best Male TV Anchor prize at the 16th Gawad Tanglaw, would be a great addition to One News given his lengthy résumé which includes successful programs for both GMA-7 and GMA News TV, such as News On Q, 100% Pinoy, The Beat, Pinoy Abroad, and On Call. If GMA-7 passes him over for the coveted 24 Oras Weekend anchor post, where he is currently leading in our MNP Poll, then Mayrina should consider looking for other opportunities elsewhere. ANC, the venerable Kapamilya news channel, has remained to this day very successful and influential, that in spite of the growing competition these past three years, it has managed to retain its standing as the number one news channel in the country. In business news alone, the ABS-CBN News Channel remains the undisputed Goliath with the indefatigable Cathy Yang at the helm. While some of Bloomberg TV Philippines anchors have impressive résumés, none have the star power and name recognition that are necessary to attract viewers and advertisers. In changing its game plan, what One News should do is to bring in Nancy Irlanda, the former ANC anchor and producer, who was last seen as substitute anchor for Tina Monzon-Palma on The World Tonight. Like Cathy Yang, Irlanda is also a beloved figure in the world of Philippine business news and she also possesses the necessary news chops and credentials that could help strengthen the Cignal news channel's business news reporting.